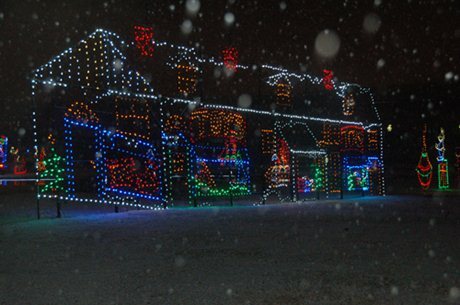 For something new to do this holiday season, check out the Lancaster County holiday lights display at Elizabeth Farms. The “Gift of Lights”is a drive-thru experience which promises to be an unforgettable adventure designed especially for the entire family. Elizabeth Farms is a short drive west on 322 from the Historic Smithton Inn, making us an ideal bed and breakfast to call home as you enjoy a Lancaster County Christmas! The drive-thru spans approximately one mile and features hundreds of thousands of LED lights twinkling with music, in dazzling seasonal displays. The Gift of Lights runs from Nov. 18 through Jan.1, including Christmas Day, from 5 to 9 p.m. Sundays through Thursdays and Fridays and Saturdays from 5 to 10 p.m. Admission is $15 per vehicle, and a portion of the proceeds will be donated to Toys for Tots and Goodwill Keystone Area. Tickets can be purchased at Elizabeth Farms, or in advance at the Historic Smithton Inn. For anyone worried about the environmental consequences of a million-plus light display, you can rest easy knowing that the Gift of Lights is an environment-friendly attraction. The LED lights use much less electricity (only 4 watts for a 70-light string) and have a much greater lifespan than incandescent lamps. Additionally, Elizabeth Farms features more than 200 acres of evergreens, horse-drawn wagons, Santa’s Workshop, a model train and festive holiday displays.